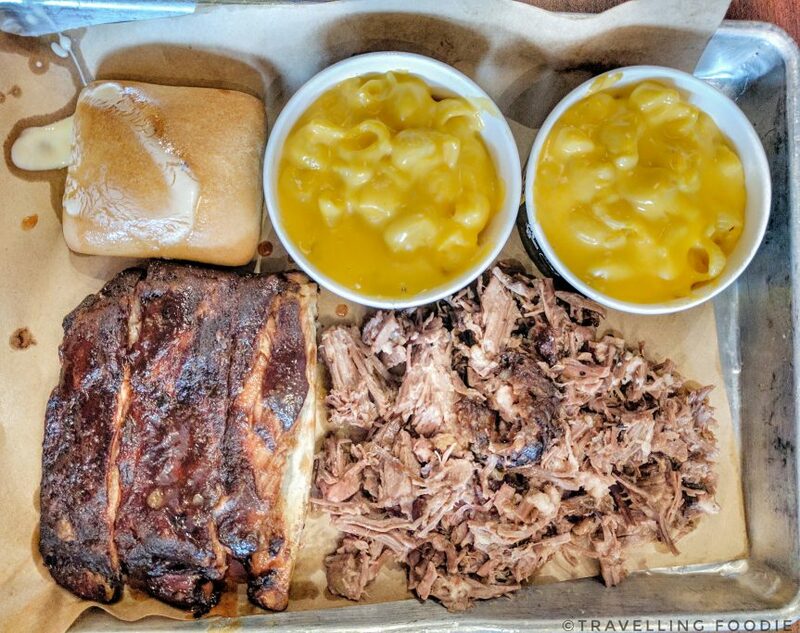 Dickey’s Barbecue Pit is an American barbeque join which first opened in 1941 in Dallas, Texas by Tavis Dickey as a family-operated restaurant specializing in slow-smoked barbecue. We visited this place because of a Groupon that we had purchased. Since we were visiting Roman Aroma after, we decided to go to the Redondo Beach location. The joint is in the Redondo Shores Shopping Center at the northwest corner. It’s a little hard to find since there’s no big signs that pops out when looking around from the parking lot. We ordered the Three Meat Plate for $16.95 in which we chose 1/2 Beef Brisket, 1/4 Pulled Pork with Mac and Cheese and Waffle Fries. They smoke their meat with real hickory wood and you can really smell it when it comes out! Their beef brisket had mixed feelings for me: the parts where the meat was marbled was amazing – melt in your mouth tender. But there were also non-marbled parts that was quite tough. The pulled pork was actually a winner for me! It was consistently tender and flavourful with a hint of fattiness you expect. Travelling Foodie Tip: make sure to try their sauces with the meat as it enhances the overall flavour! The Mac and Cheese was also really good! It was very cheesy and the macaroni was nicely cooked. However, it was very small portion that they give, which is a shocker for me since most American joints tend to give big sides. One thing they should inform is that you can also get the ribs with the Three Meat Plate. In the sign for Three Meat Plate, it only mentioned taking meats by the pound, in which ribs only had a half or full rack so we weren’t aware we can actually get them. However, my brother did ask them and was able to get them for his Three Meat Plate, and he said it was really delicious but you only get 3 bones. Posted on January 26, 2017 by Travelling FoodiePosted in California, Food, Redondo Beach, USATagged restaurants.